Whoa baby is it cold outside! I think most of the country has been hit with some kind of cold snap over the last week – DC certainly has. I may have grown up in Boston but I have lived down here long enough to become a complete wimp when it comes to the cold. I just want to snuggle by our fireplace with a kitty and a nice glass of red. This quick dinner is perfect for a cold night when you want some comfort food. Sure you have to stand over the pan the whole time but think of it as a way to warm you up! If you have forgotten, here are my risotto rules. This version includes two of my favorite things – goat cheese and a bitter lettuce, namely radicchio. The two really play off of each other nicely and if you add some chives at the end you can get red and green for the holidays! Thankfully we haven’t had to shovel yet (eek!) but I think this would be a great way to defrost after doing so. Add the stock to a small saucepan and warm over low heat. In a high sided skillet or larger saucepan melt the butter over medium heat with the olive oil, then add the shallots and cook for 5 minutes. Add the rice and stir it around until all the grains are coated in the butter. Reduce the heat to medium low. Splash in the wine and use your spoon to stir the rice. Once almost all of the wine has cooked off you can start ladeling in the stock. Add 1 ladelful at a time, stirring near constantly. Once the rice starts looking dry add in another ladelful. After about 25 minutes I start checking the doneness of the rice but usually it will take closer to 30 or 35 minutes to cook. Once the rice is done (its tender with just a little bit of bite to it) stir in the goat cheese and radicchio and cook for another minute or two more, allowing the radicchio to wilt and the goat cheese to melt in. Sprinkle with chives and season with salt and pepper. Add the stock to a small saucepan and warm over low heat. In a high sided skillet or larger saucepan melt the butter over medium heat with the olive oil, then add the shallots and cook for 5 minutes. Add the rice and stir it around until all the grains are coated in the butter. Reduce the heat to medium low. Splash in the wine and use your spoon to stir the rice. Once almost all of the wine has cooked off you can start ladeling in the stock. Add 1 ladelful at a time, stirring near constantly. Once the rice starts looking dry add in another ladelful. After about 25 minutes I start checking the doneness of the rice but usually it will take closer to 30 or 35 minutes to cook. Once the rice is done (its tender with just a little bit of bite to it) stir in the goat cheese and radicchio and cook for another minute or two more, allowing the radicchio to wilt and the goat cheese to melt in. Sprinkle with chives and season with salt and pepper. One last no cook dish before the summer is over!! I actually make this year round since the ingredients are pretty season-less. This dish is a great side to roast chicken, pistachio crusted pork tenderloin, or as part of a picnic. Since its no cook it can also be served at room temperature. I actually like the beans after they have sat in the vinaigrette for a while – let it sit for at least 15 minutes but overnight is even better. I would hold off on adding the arugula as it will wilt, until right before you serve. I like to bring the left overs in as lunch even with the wilted arugula, it doesn’t change the taste it just doesn’t look as pretty. I know a lot of you are wondering why I used canned beans – the main reason is convenience, with them this dish takes 5 minutes. However, I have to be honest with you all – I cannot cook dried beans. Every time I try I end up with a mushy mess or under cooked beans. Perhaps someday I will conquer them along with fresh pasta but until then, thankfully we have the can! Check back in on Thursday where I am posting the PERFECT way to say goodbye to summer. In a large bowl toss the beans with the shallot, thyme, lemon zest and juice and olive oil. (Remember my trick and use the back of your zester to catch the lemon seeds as you juice it.) Season with salt and pepper and the red pepper flakes. Let the beans sit in the vinaigrette for at least 15 minutes or up to overnight in the fridge (let the beans come to room temperature if you are storing in the fridge). Don’t worry if it looks like there is too much liquid – the beans will take on some of it and it will leave some to coat the arugula. When you are ready to serve toss in the arugula and serve. All summer long I feel like I am looking for fresh salads that can multi purpose – as a side to grilled chicken one night for dinner, leftovers for lunch, eaten at room temp for a picnic, easy for a potluck…the list goes on. Grain salads are great for this because even the sturdiest of greens will wilt under dressing and heat, and they are more satisfying if eaten on their own as a vegetarian meal. Farro is my favorite grain by far – it’s Italian so of course yummy, it is also good for you and very easy to cook. I featured it before in this salad and got rave reviews from readers. This one is even better for summer months as it doesn’t require any oven usage, a must in my DC kitchen. Puttanesca is an Italian sauce that is usually served over pasta (though makes a terrific topper for fish or chicken as well). Rumor has it that ladies of the night used to make this tangy pungent sauce and put it out to attract customers. I always like a saucy story to go with my food but have no idea if that’s where the name came from. What I do know is that the mixture of salty olives, tangy capers, sweet onions, briny anchovies and juicy tomatoes make for a perfect summer salad. In a pot cook the farro in boiling salted water (like pasta) for about 20 minutes until tender, drain. Meanwhile heat the olive oil in a skillet over medium heat. Add the onion and garlic and cook for 10 minutes. Add the capers, kalamata olives, tomatoes,.anchovy paste, and thyme and cook for 4 minutes more for the flavors to combine. Add the wine and turn to medium high and cook for another couple of minutes until the wine cooks out. Add the drained farro into the pan, toss all together and serve with chopped parsley on top. Can be served hot, room temperature or stored in the fridge for several days. In a pot cook the farro in boiling salted water (like pasta) for about 20 minutes until tender, drain. Meanwhile heat the olive oil in a skillet over medium heat. Add the onion and garlic and cook for 10 minutes. Add the capers, kalamata olives, tomatoes,.anchovy paste, and thyme and cook for 4 minutes more for the flavors to combine. Add the wine and turn to medium high and cook for another couple of minutes until the wine cooks out. Add the drained farro into the pan, toss all together and serve with chopped parsley on top. Can be served hot, room temperature or stored in the fridge for several days. I first had the idea to make this fried rice ages ago – I was at Doi Moi on 14th Street with my friend Amy and we had two unbelievably delicious dishes. One was stir-fried pineapple that was spicy and sweet and savory all at once. The other is their famous crab fried rice that not only includes terrific local lump crab meat, but also lets all the other ingredients sing. I think years of crappy fried rice in college had led me astray because I always thought it was slightly greasy and not very flavorful. Well that night at Doi Moi was a revelation and I spent a lot of time figuring out how to marry that dreamy fried rice with balanced flavor with the intriguing pineapple side dish. Turns out the key to both elements is a very hot pan and just a little bit of oil. The heat helps the pineapple really caramelize so it has a more complex sweetness. It also means the other ingredients like the rice and peppers won’t take on as much oil. It’s also a good idea to use leftover as opposed to fresh rice, the dryness helps with the oil as well (I used brown rice I had tucked in my freezer). The result is absolutely delicious and the perfect vegetarian main meal or side to grilled meat or fish. I had been drooling over images of pineapple bowls on Pinterest so just had to try my hand at it. I won’t say it was immediately easy to do (or explain as you can see by my tortured explanation below) but just dive in. By the time I was doing the second half I had figured out the best way for me and it was a breeze. The good news is since you are chopping up the pineapple anyway it doesn’t really matter what it looks like once you have scooped it out. What a fun way to spice up the middle of the week ! If you want to use the pineapple as your serving dish use a large knife and cut through the center of the pineapple lengthwise, through the leaves and everything. Then use a small paring knife and follow the edge of the pineapple with the knife at a slight angle. Use the paring knife to cut out the harder core (throw that away) that runs down the middle and then with the help of a spoon and the knife, cut out pieces. It gets easier as you do it, just make sure to not cut through the skin of the pineapple. Once you have most of the fruit out you can use a spoon to scrape the edges and create a wide bowl for the rice. Dice the pineapple you scooped out into a small dice until you have 2 cups (save any remainder for a snack later). In a large skillet heat 1 tablespoon of canola oil over high heat. Add the pineapple and cook for 3 to 5 minutes until the pineapple caramelizes a bit. Add the onion, garlic, ginger and chilis and cook for another 3 minutes. Add the remaining 2 tablespoons of canola oil and the rice and stir to combine. Add in the soy sauce and cook the rice, stirring frequently for another 3 minutes. Stir in the scallions and serve in the pineapple “bowls” or a large serving bowl. If you want to use the pineapple as your serving dish use a large knife and cut through the center of the pineapple lengthwise, through the leaves and everything. Then use a small paring knife and follow the edge of the pineapple with the knife at a slight angle. Use the paring knife to cut out the harder core (throw that away) that runs down the middle and then with the help of a spoon and the knife, cut out pieces. It gets easier as you do it, just make sure to not cut through the skin of the pineapple. Once you have most of the fruit out you can use a spoon to scrape the edges and create a wide bowl for the rice. Dice the pineapple you scooped out into a small dice until you have 2 cups (save any remainder for a snack later). In a large skillet heat 1 tablespoon of canola oil over high heat. Add the pineapple and cook for 3 to 5 minutes until the pineapple caramelizes a bit. Add the onion, garlic, ginger and chilis and cook for another 3 minutes. Add the remaining 2 tablespoons of canola oil and the rice and stir to combine. Add in the soy sauce and cook the rice, stirring frequently for another 3 minutes. Stir in the scallions and serve in the pineapple “bowls” or a large serving bowl. One pot dishes are made for the winter time – they are so warm and comforting (and easy cleaning goes with every season). I love a good risotto but it can seem like a lot of starch to constitute an entire meal so I decided to think of a way to incorporate some leftover chicken I had. By using marsala wine instead of the normal white wine and adding in sautéed mushrooms, this easy weeknight risotto becomes plenty filling. The basics are all the same (in case you need my risotto rules again here they are). One deviation is stirring in some extra marsala at the end of the cooking. I found that too much of the flavor was lost when you just use it at the start and by adding a dash at the end you get that sweet savory wine flavor burst. And remember, don’t scrimp on the fresh grated parmesan at the end!! Over medium high heat in a large saucepan melt the butter. Add the mushrooms and season with pepper (but not salt). Cook for 5 minutes or so until the mushrooms have softened and are beginning to brown. Spoon out the mushrooms and set aside. Add the olive oil to the same pan and heat over medium. Add the rice and stir it around until all the grains are coated in the oil. Reduce the heat to medium low and add 1/2 cup of the marsala wine. Use your spoon to stir the rice as well as deglaze the bottom of the pan. Once almost all of the marsala wine has cooked off you can start ladeling in the stock. Add 1 ladelful at a time, stirring near constantly. Once the rice starts looking dry add in another ladelful. After about 25 minutes, add the mushrooms and chicken to the pot and start checking the doneness of the rice. It will probably take another 5 minutes to cook. Once the rice is done (it’s tender with just a little bit of bite to it) stir in the remaining 1/2 cup of marsala and cook it for 1 minute more so most if not all of the wine is absorbed. Take it off the heat and stir in the parmesan. Check for seasoning and add salt and pepper if needed and serve immediately. Over medium high heat in a large saucepan melt the butter. Add the mushrooms and season with pepper (but not salt). Cook for 5 minutes or so until the mushrooms have softened and are beginning to brown. Spoon out the mushrooms and set aside. Add the olive oil to the same pan and heat over medium. Add the rice and stir it around until all the grains are coated in the oil. Reduce the heat to medium low and add 1/2 cup of the marsala wine. Use your spoon to stir the rice as well as deglaze the bottom of the pan. Once almost all of the marsala wine has cooked off you can start ladeling in the stock. Add 1 ladelful at a time, stirring near constantly. Once the rice starts looking dry add in another ladelful. After about 25 minutes, add the mushrooms and chicken to the pot and start checking the doneness of the rice. It will probably take another 5 minutes to cook. Once the rice is done (it’s tender with just a little bit of bite to it) stir in the remaining 1/2 cup of marsala and cook it for 1 minute more so most if not all of the wine is absorbed. Take it off the heat and stir in the parmesan. Check for seasoning and add salt and pepper if needed and serve immediately. To me cooking is like therapy – I can stop thinking about everything else in the world and just focus on turning raw ingredients into great food. I like the ritual of cooking classics and I like the fun and excitement of cooking new things. Of course the result itself can often serve as its own sort of remedy, especially comfort food. Risotto is one of my favorite therapeutic meals because the method is so soothing and the meal itself is creamy and soft and lovely. I have been toying with the idea of making a corn risotto for a while so when we were on the Eastern Shore of Maryland a couple of weeks ago I made sure to pick up some super fresh ears from a farm stand. The sweetness of the corn is such a good match with the creaminess of the risotto. Here I made my own corn broth using the cobs of the corn going into the risotto. I think this really bumps up the corn flavor but it also adds about 40 minutes to the process. You could either make the broth the day before and just store the kernels in the fridge or skip that step all together and use chicken or veggie stock you have on hand. One common misconception about risotto is that there is actual cream in it – there isn’t. Ok maybe some recipes include it, and I am SURE it wouldn’t be bad, but it’s just not needed. 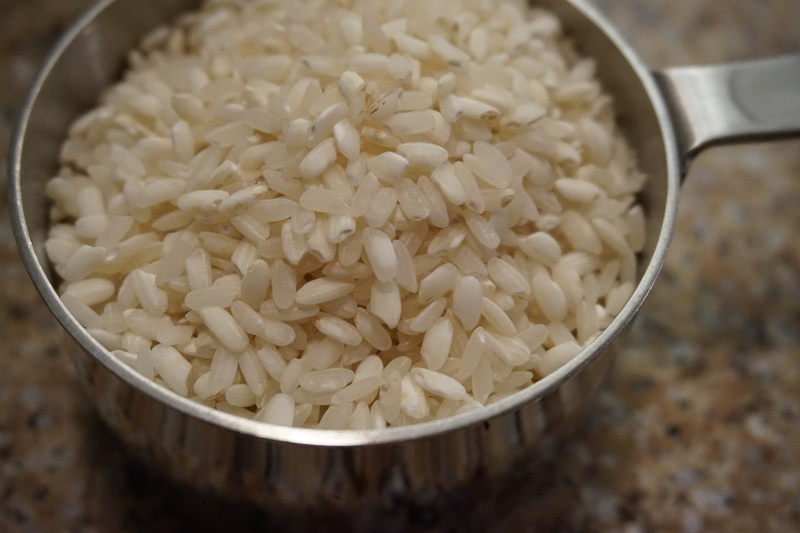 The special aborio rice used in risotto is really starchy so as you slowly cook it with stock the starch is released and creates its own creaminess. Whether you are making corn risotto or another kind there are certain rules of the road that you should follow to ensure the right texture. Once you have learned the basics risotto can really become a vehicle for any ingredient you would like. Use aborio rice. This Italian short-grain rice is made for risotto – some recipes recommend carnaroli rice but I have tried it before and it just doesn’t get the same result as aborio. You can really find this rice in most supermarkets these days in the Italian section, but if not there are plenty of it to be found online. I do not have a favorite brand but if someone does please chime in. Do not use a risotto mix. These things are lunacy! It’s basically aborio rice with dehydrated flavorings included. I am all for mixes that taste good and actually save you some time but you still have to do all the work with these and the taste is just never going to be as good as something you can put together yourself. Trust me. Go with shallots over onions. If all you have is an onion then by all means but I think shallots are a much softer and sweeter flavor that works well in risotto. And who can say no to a lavender colored onion?? Make sure to toast the rice and coat with fat. 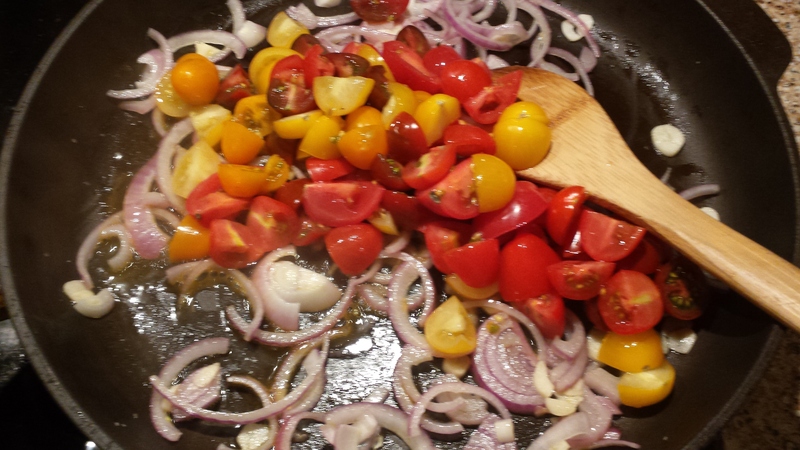 Once you have sautéed the shallots in butter and or olive oil make sure to add the rice and stir it around. This will help toast the rice a bit, giving it more flavor, and also coat it in fat. This will help the grains of rice stay separate and in tact during the cooking process. Wine! Make sure to add a splash of wine first before you start with the broth. Usually you should use a dry, crisp white but sometimes it’s fun to use red and end up with pinkish risotto. Keep your broth warm. You do not want to add cold broth to your risotto as it will cause the rice to seize up and it will not take on the broth as well, taking longer and resulting in uneven cooking. In a separate saucepan keep your broth over low heat and make sure its close for easy ladeling. Stir, stir and stir again. Part of the magic of risotto is that starchy goodness that comes out of the rice. The best way to move it along is to constantly stir. Some people find this annoying but as I said I think it’s pretty relaxing. You can certainly walk away from the pot to pour yourself a glass of wine or give your arm a rest but don’t go too far. If you don’t stir it won’t get really thick and you run the risk of the bottom burning. If you get the temperature right risotto really only takes 30 mins max, so not that much stirring. Don’t over cook. Make sure you keep the temperature pretty moderate while you are adding the broth so the rice has time to absorb the liquid. I keep a fork handy so I can continuously check the doneness of the rice. It’s supposed to be al dente with a little bit of bite to it but heck since you took the time to make your own you can call it done whenever it reaches the doneness you like! 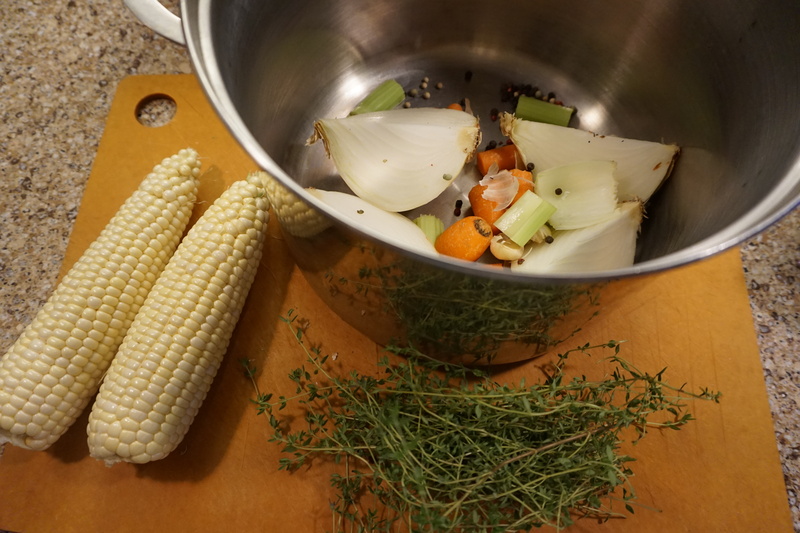 If you are making the corn stock put the corn cobs (kernels removed) in a large pot with the onion, carrots, celery, thyme, bay leaves, garlic, salt and peppercorns. Cover with 6 cups of water and then bring to a boil. Cover and then reduce the heat to low and let it simmer for 30 minutes. When its done strain the liquid into a smaller saucepan, removing all the solids. Warm the stock over low heat. If you are not making the corn stock at this point add the chicken or veggie stock to a small saucepan and warm over low heat. In a high sided skillet melt the butter over medium heat, then add the shallots and cook for 2 minutes. 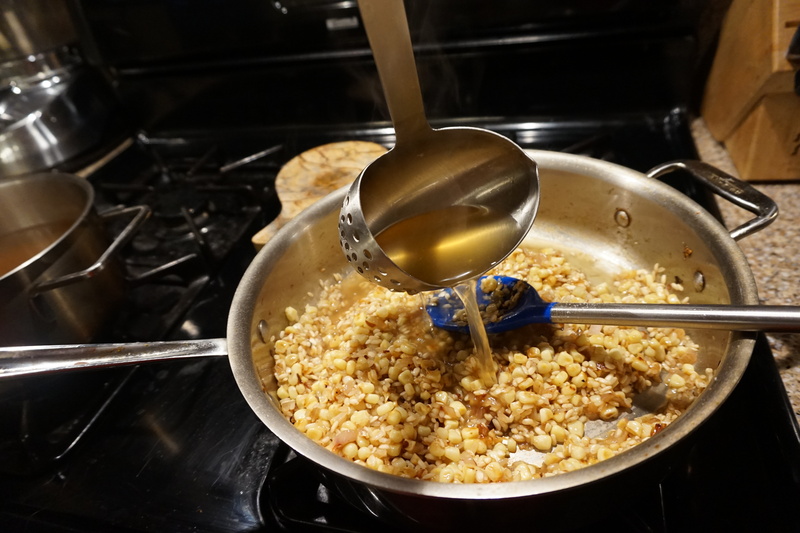 Add the olive oil and increase the heat to medium to medium high and add the corn kernels. Season with salt and pepper and cook for 4 to 5 minutes. The sugars in the corn will start to caramelize and crust up the bottom of the pan which is fine, just don’t let the corn burn (if you need to turn down the heat). Add the rice and stir it around until all the grains are coated in the oil and butter. Reduce the heat to medium low again. Splash in the wine and use your spoon to stir the rice as well as deglaze the bottom of the pan. Once almost all of the wine has cooked off you can start ladeling in the stock. Add 1 ladelful at a time, stirring near constantly. Once the rice starts looking dry add in another ladelful. After about 25 minutes I start checking the doneness of the rice but usually it will take closer to 30 or 35 minutes to cook. Once the rice is done (it’s tender with just a little bit of bite to it) take it off the heat and stir in the parmesan. Check for seasoning and add salt and pepper if needed. Top with chopped chives and serve immediately. If you are making the corn stock put the corn cobs (kernels removed) in a large pot with the onion, carrots, celery, thyme, bay leaves, garlic, salt and peppercorns. Cover with 6 cups of water and then bring to a boil. Cover and then reduce the heat to low and let it simmer for 30 minutes. When its done strain the liquid into a smaller saucepan, removing all the solids. Warm the stock over low heat. If you are not making the corn stock at this point add the stock to a small saucepan and warm over low heat. In a high sided skillet melt the butter over medium heat, then add the shallots and cook for 2 minutes. 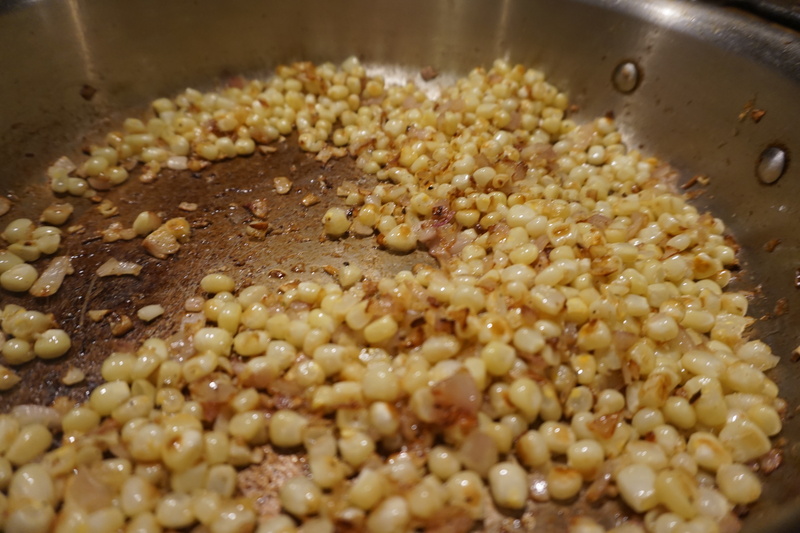 Add the olive oil and increase the heat to medium to medium high and add the corn kernels. Season with salt and pepper and cook for 4 to 5 minutes. The sugars in the corn will start to caramelize and crust up the bottom of the pan which is fine, just don’t let the corn burn and if you need to turn down the heat. Add the rice and stir it around until all the grains are coated in the oil and butter. Reduce the heat to medium low again. Splash in the wine and use your spoon to stir the rice as well as deglaze the bottom of the pan. Once almost all of the wine has cooked off you can start ladeling in the stock. Add 1 ladelful at a time, stirring near constantly. Once the rice starts looking dry add in another ladelful. After about 25 minutes I start checking the doneness of the rice but usually it will take closer to 30 or 35 minutes to cook. Once the rice is done (its tender with just a little bit of bite to it) take it off the heat and stir in the parmesan. Check for seasoning and add salt and pepper if needed. Top with chopped chives and serve immediately. For the last week I have been eating vegan for breakfast and lunch – cue the gasps and screams! It’s part of a get healthy kick brought on by an impending birthday. Made popular by Mark Bittman of the New York Times this kind of eating called “VB6” essentially means cutting out meat and dairy until around 6pm or dinnertime. I am only a week in but I know I definitely feel better about the choices I am making and I haven’t felt too deprived. Never in a million years would I give up cheese 100% but something about not having it most of the day means that when you do have it you feel like it’s a treat rather than something you should be eating all the time. One thing that has been tough is thinking of lunches that really satisfy and help carry me through the day. Then I remembered this great side dish that I make – it can still be used as a side to tandoori chicken or grilled shrimp but it would also be just as good as lunch, maybe over some brown rice if you need more heft. There is plenty of protein from the chickpeas and the spinach gives you a nice dose of iron. I am not sure how long I am going to stick with this VB6 thing but dishes like this certainly make it easier to stay on track. Inspiration: fridge and pantry clean out! Heat the olive oil in a skillet over medium heat. Add onion and garlic and sweat out for 2 minutes, watching the garlic so it doesn’t burn. Add the spices and then the tomatoes (you can use canned tomatoes if that’s all you have just use a can of chopped tomatoes and drain off the liquid) and cook down until they have released their liquid and are starting to brown, about 4 minutes. Stir in the chickpeas and then add the spinach in handfuls. If you cannot fit it all in at once wait until some wilts down and then add more. Cook for 4 minutes more until all the spinach has wilted and combined with the other ingredients. Heat the olive oil in a skillet over medium heat. Add onion and garlic and sweat out for 2 minutes, watching the garlic so it doesn’t burn. Add the spices and then the tomatoes (you can use canned tomatoes if that’s all you have just use a can of chopped tomatoes and drain off the liquid) and cook down until they have released their liquid and are starting to brown, about 4 minutes. Stir in the chickpeas and then add the spinach in handfuls. If you cannot fit it all in at once wait until some wilts down and then add more. Cook for 4 minutes more until all the spinach has wilted and combined with the other ingredients.